The total net assets of this Ultrashort Bond fund are $2.4 billion. The annual expense ratio is 0.90%. This is quite high compared to the average in the category (0.62%). The fund has 1.13% dividend yield. The most recent distribution was in June 2013 with $0.01. The fund has been managed by Randall S. Bauer since its inception. The fund is rated with 3-stars rating from Morningstar. The best 1-year total return was in 2009 with 8.98%. The worst was in 2008 with -4.44%. Based on the load adjusted returns, the fund has returned 1.72% over the past 5-year and 1.83% over the past decade. The 3-year beta risk is 0.11. The minimum initial investment for brokerage account is $1,500. For subsequent investment, it needs a minimum of $100. The fund is also available in Institutional Class (FULIX) and Service Class (FULBX). The 12b1 fee is 0.30%. There is 2.00% front-end sales load fee. This FULAX fund can be purchased from a range of 90 brokerages, such as Merrill Lynch, JP Morgan, Edward Jones, Scottrade Load, Pershing FundCenter, TradeStation Securities, etc. As of the second quarter of 2013, this Federated Ultrashort Bond Fund has 402 securities. 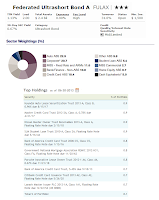 The top holdings are Hyundai Auto Lease Securitization Trust (0.9%), Master Credit Card Trust (0.9%), Nissan Master Owner Trust Receivables (0.9%), SLM Student Loan Trust (0.9%), Bank of America Credit Card Trust (0.8%), Government National Mortgage Association (0.8%) and Porsche Innovative Lease Owner Trust (0.8%). 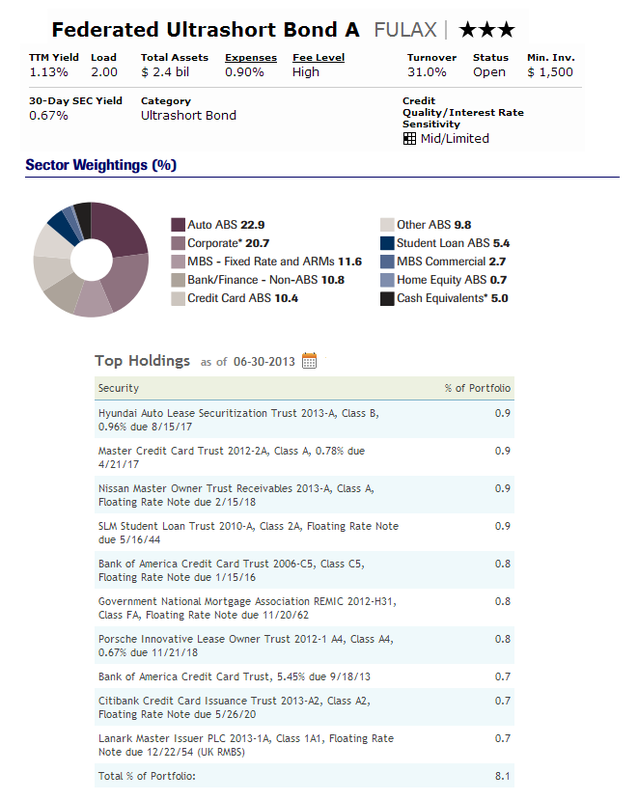 The top sectors are Auto ABS (22.9%) and Credit Card ABS (10.4%). There are several main risks in investing in this fund. They are interest rate risk, counterparty credit risk, issuer credit risk, prepayment risk, call risk, liquidity risk, risk associated with complex CMOs, risk associated with noninvestment-grade securities, risk related to the economy, risk of foreign investing, leverage risk, technology risk, risk of investing in derivative contracts and hybrid instruments.